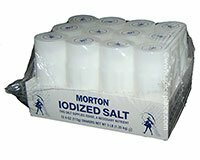 Pack of 12 Individual Shakers of Morton® Iodized Salt For Foodservice Use. This Salt Supplies Iodide, A Necessary Nutrient. Each shaker contains 4oz of salt. Carton contains 12 disposable shakers. Morton is a registered trademark of Morton International Inc, Chicago IL, USA.